Unsupported objects include Symbols, Meshes, Graphs, Blend Shapes, Clipping Masks and also plugin items. Unsupported features include Patterns, Freeform Gradients, Graphic Styles, Filters or color's Blending Modes. While Fontself attempts to automatically convert most Illustrator objects into shapes that can be displayed into fonts, if you hit the unsupported feature limitation, you can try a few workarounds. To bypass these limitations, you can try breaking objects into more regular Path items and Shapes. Try using Object > Expand Appearance or Object > Flatten Transparency... as these commands can help in some instances. Just select a Symbol and press Break Link in the Control Window to turn it into a regular Shape. Try to break the shape into actual points. Run Object > Expand... and pick both Fill and Stroke options. The result will feature a more complex object that includes the entire underlying pattern under a mask shape. 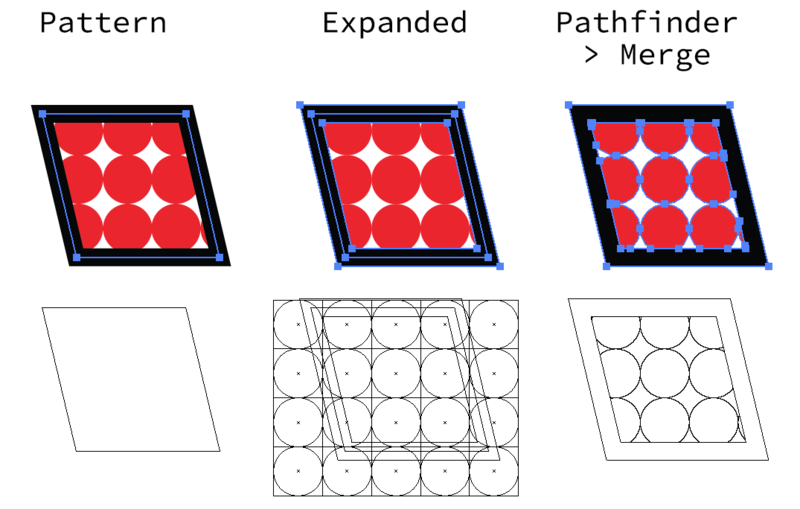 To clean this up, you can use Pathfinder > Merge to generate a simpler object that can be imported as a glyph.